By the time you’re reading this, I’m probably chowing down on some delicious vegan food in San Francisco. Gav and I are here for Pinterest’s very first conference and I’m so incredibly excited about it. I’m also so happy to be back in San Francisco! I had such a blast on my last trip and I can’t wait to show Gav all the things, and all the amazing vegan food. There’s something about the vegan food in Cali that is absolutely top notch. 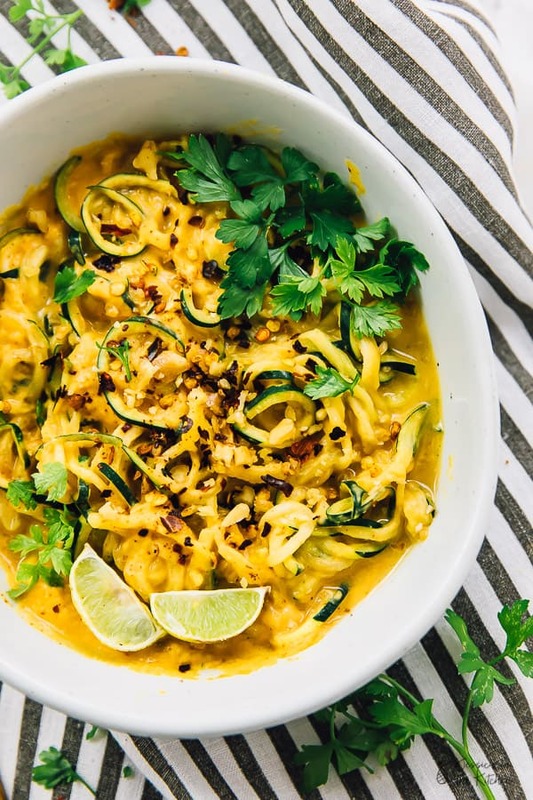 Speaking of top notch vegan dishes, we need to talk about these Curried Satay Veggie Bowls. They from my amazing friend Lindsay Cotter’s Cookbook: Nourishing Superfood Bowls: 75 Healthy and Delicious Gluten-Free Meals to Fuel Your Day. 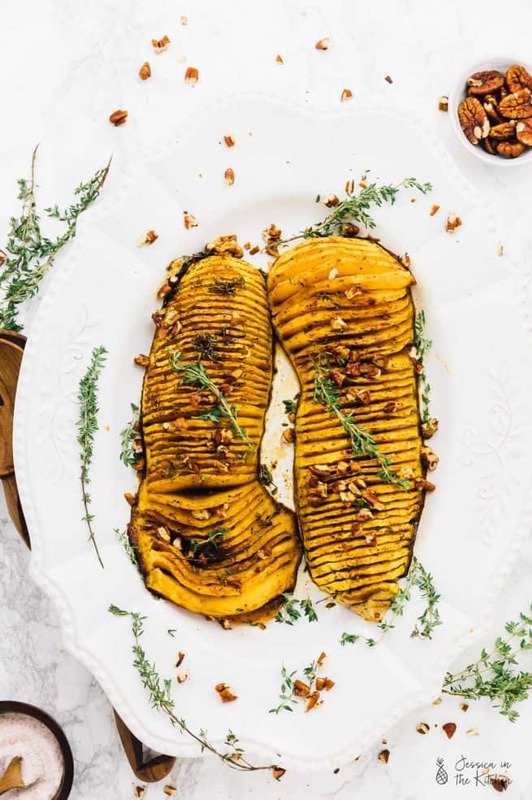 Lindsay is all about healthy and amazing gluten free dishes that work for every single occasion! Let me tell you a bit about Lindsay. She runs the gorgeous gluten free blog Cotter Crunch. Talk about phenomenal photos. I can’t remember how exactly we met, but I’m pretty sure it’s because I made one of her food videos. I was so sad to stop that little side business soon after, but was happy that a friendship seemed to blossom out of nowhere for us! She’s always so fun to talk to and we share many of the same #bloggerlife scenarios. Just like in her book, Lindsay shares some stunning bowls on her website. 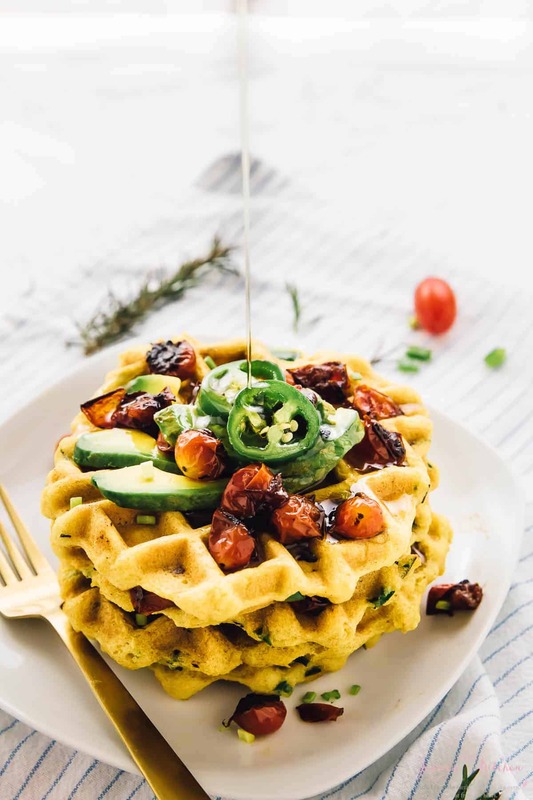 Her cookbook has so many vegan recipes and vegan options recipes that I knew I had to share it with you guys. After flipping through, I knew I had to make these Curried Satay Veggie Bowls. Let me tell you – absolute deliciousness. These noodle bowls are made with perfectly created zucchini noodles. Then covered in a delicious peanut Satay sauce that becomes almost yummy soup like due to the zucchini noodles. I loved it this way and actually waited until it got soupy, since it kind of reminded me of my coconut curry soup! Usually when I make zucchini noodles, it’s kind of a hot mess, hence why I stayed away from them for so long. But Lindsay goes into detail on how to cook them and they came out perfect. So perfect that my non gluten free husband asked to have it for dinner, then had it again the next day. After Gav tasted it he said (quote) “Wow. That’s something I could eat over and over!” (end quote). That’s definitely a fine compliment. He loves the sauce so much that we saved some to use on another weeknight dish, or for when we have more zucchinis to make this again. 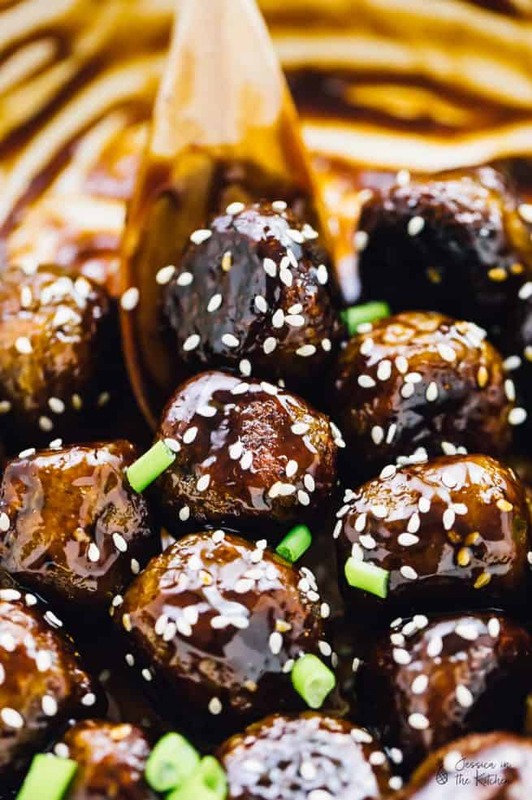 You definitely can’t go wrong with this recipe. I also love that it’s the perfect portion for two people. It’s also a great way to add protein to your meal. 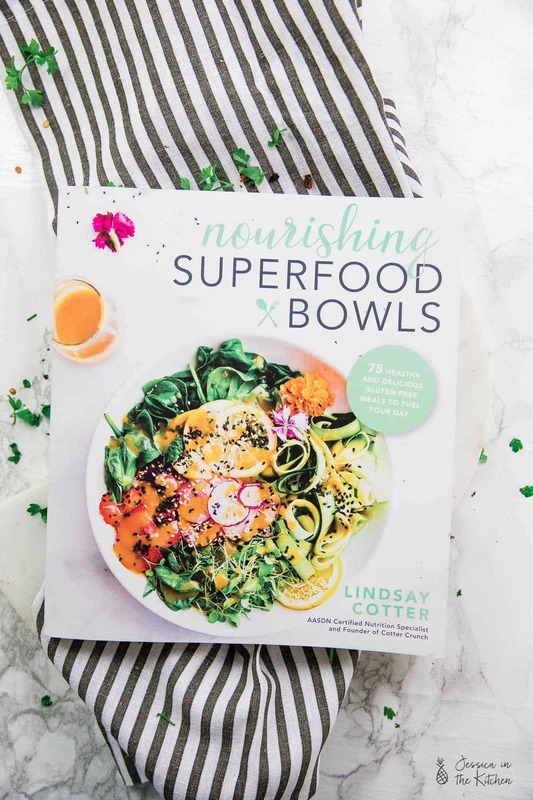 I hope you give it a try and definitely check out Lindsay’s amazing cookbook Nourishing Superfood Bowls! To make the satay sauce, combine the chickpeas, red curry paste, garlic, ginger, oil, mustard and coconut milk in a food processor or blender. Blend until mixed. With the food processor on low, slowly add the peanut butter, Lime juice/ Rice Vinegar, salt and pepper. Blend again until creamy. For thinner sauce, add 1 tablespoon (15 ml) or more coconut milk. Stop and scrape sides once or twice if needed. Put the sauce in a bowl and set aside. Extra sauce can be stored in fridge for up to 5 days. For the bowls, spiralize the zucchini, then press with a paper towel to remove the excess water. In a large skillet or wok, add the oil and stir fry the zucchini noodles with the tamari for 5 minutes, or until zucchini noodles are soft, but not mushy. Remove and place zucchini noodles in one large serving bowl or 2 smaller serving bowls. 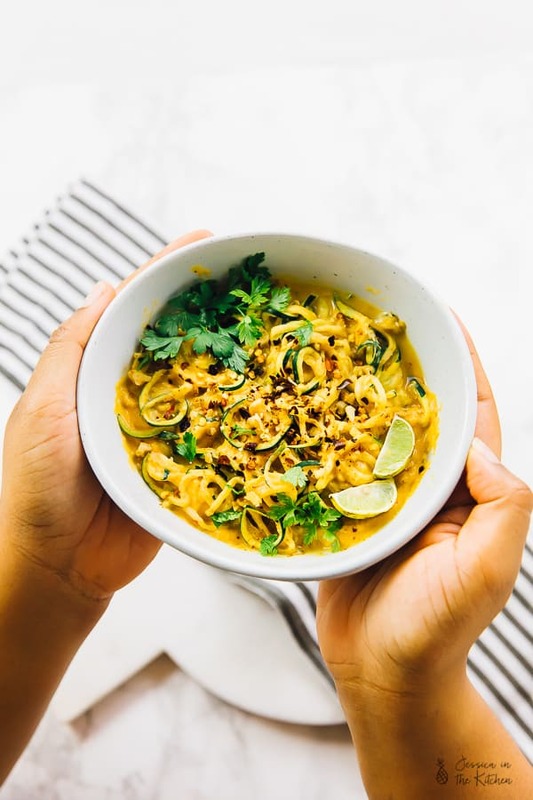 Drizzle each bowl with the creamy satay sauce and top with a handful of ribbon-cut vegetables, cilantro, crushed nuts and crushed red pepper flakes. Add a dash of Sriracha, if desired. Once you add the sauce, serve immediately. Due to the high water content in the zucchini noodles, the sauce will become soupy if left to sit. Simply add more zucchini noodles to thicken the sauce, or spoon out a few tablespoons of liquid. But not to worry: even the thinned out sauce is delicious with the noodles. Totally slurp worthy! 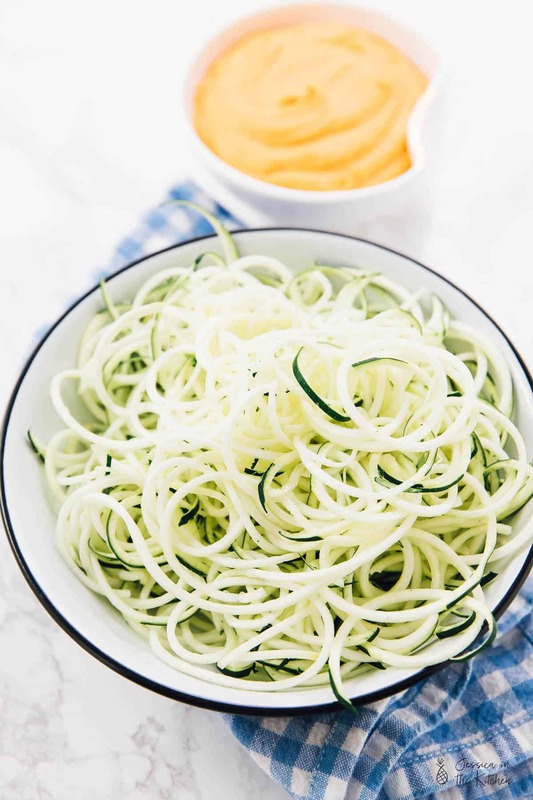 Note: To make zucchini noodles without a spiralizer, simply julienne slice them or use a potato peeler to create long flat shavings or ribbons. Vinegar in the instructions for sauce but not listed in the ingredients?? Thanks for pointing this out Angela we meant to put lime juice instead. It’s now updated on the blog I hope this helps! WHAT KIND AND HOW MUCH VINEGAR? Sorry about the confusion Loyd! You can either use a dash (roughly half a teaspoon) of lime juice or rice vinegar. We have made corrections on the site to reflect this. I hope this helps! I just made this (substituting great northern beans for chickpeas) and it was fantastic! It had not occurred to me to make a bean-based sauce before seeing this recipe and now it’s opened a whole new world for me. Thank you! Wow Anne thank you for you comment! The substitution you did sounds really delicious! We’re glad we were able to help you in any way! Thanks again for reading! I never comment on blogs but after making this recipe twice I had to. Thank you so much for sharing it! Hugs from south of Brazil! this sounds/looks amazing…do I drain the juice from the beans? Yes! Also, you should rinse them first! I hope you enjoy so much! !